Tragedy struck hockey club Yaroslavl Locomotive in September 2011 when a plane crash killed its entire roster. As part of its plans for rebuilding, the club hired American Tom Rowe, a former assistant coach of the Carolina Hurricanes, to take it to the top of Russia’s KHL. But after a disastrous start to the 2013 season, Rowe was let go. 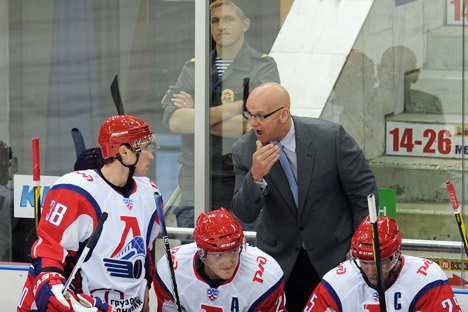 After five losses in six games so far in the 2013-2014 Kontinental Hockey League (KHL) season, Yaroslavl Lokomotiv fired its head coach, American Tom Rowe. Petr Vorobyev, who contributed to the team's success in the 1990s, was named the new head coach. The shake up was especially difficult for the team, which is still trying to recover from the loss of its entire squad in a plane crash on Sept. 7, 2011. That day players had been headed to Minsk, where they were scheduled to play their first match of the 2011-2012 KHL season, when their plane collided with a tower mast beyond the runway upon takeoff and crashed into a river. Of the 45 passengers on board, 43 were killed, including 25 Lokomotiv players and the entire coaching staff headed by Canadian Brad McCrimmon. Team winger Alexander Galimov was hospitalized with burns over 90 percent of his body and died in a hospital five days later. Only the flight engineer survived the crash. Among the dead were some foreign players familiar to NHL fans, including Slovakian Pavol Demitra and Belarusian Ruslan Salei. After the tragedy, Lokomotiv canceled the rest of their season, concentrating on creating a new team. As the team gathered talented younger players from other Russian teams and called up some of the players at its school, it began playing in Russia’s second-tier Major Hockey League (MHL), starting in December 2011. In summer 2012, the team hired Rowe as head coach. The choice raised questions from the very beginning. The American had little experience as head coach of a major team. He had coached the American Hockey League (AHL) clubs Lowell Lock Monsters and Albany River Rats. But immediately before his move to Yaroslavl, Rowe was an assistant coach for the NHL’s Carolina Hurricanes. "This is a great opportunity for me," said Rowe on the day he was named head coach. "I am glad to be back in the position of steering a club in such a great league as the KHL." Lokomotiv started the 2012-2013 season strong, losing only twice in the first 11 matches. The team continued to play consistently and reached the playoffs with a fourth place ranking in its conference. However, in the first round of the playoffs, Rowe's team unexpectedly lost to Cherepovets Severstal with a score of 2-4 in the series, ending its season. Before the 2013-2014 season began, the Lokomotiv lineup underwent some major changes, signing on some promising newcomers such as David Ullström of the New York Islanders. Many of the club's former junior league players returned to the team, including Ilya Gorokhov, who came from current KHL league champion Moscow Dinamo. Gorokhov, 36, was named Yaroslavl team captain. "I want to help the young team in some way, to teach the guys the nuances of hockey. And I really want to see the team become rejuvenated because everyone loves ice hockey in Yaroslavl. The city needs hockey," said Gorokhov before the start of the season in an interview with RIA Novosti. In the off-season, Lokomotiv did well, achieving five victories in eight test matches. But the team began the regular season with losses – five defeats in six games. It wasn't surprising that people began to talk about replacing the American head coach after the first three games, in which Lokomotiv didn't score a single point. "If you look at the lineup of Lokomotiv, they don't have leaders who could take charge. But the coach is the most important. He doesn't exhibit much charisma, it is completely unclear what he wants, what his goal is," sports commentator Sergei Gimaev told the F-Sport news agency on Sept. 13. So it was little surprise when the decision to dismiss Rowe was made on Sept. 19. The American was replaced by Russian coach Petr Vorobyev, a local hero in Yaroslavl who led Lokomotiv to the gold medal in the 1997 Russian championship for the first time in team history.